I bought a 5 gauge kit (white faced) from AutoMeter. 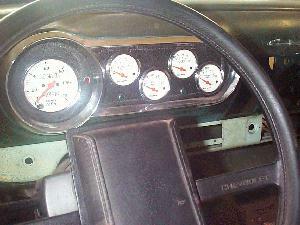 The Gauges were terrific looking and a breeze to install. I took out the original gauges and saved the trim ring. I took a piece of scrape sheet metal (actually it was an old piece of Door skin that I had, (remember to keep everything, because I'm sure you will always be-able to make use of it later!! 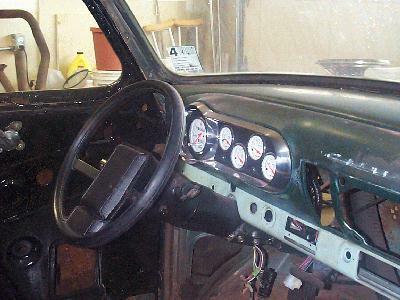 ), and cut out all the holes for the new gauges. I then matched the shape of the original trim ring and cut the piece to fit. I sanded the piece smooth and then scuffed it with a scotch-brite pad so the paint would adhere to it. I painted the piece utilizing a Black Wrinkle finish paint from the Eastwood Company. The Gauge panel looks great with the new wrinkle paint, which really makes the white faced gauges stand out. I wired the entire Gauge Panel using a panel wiring kit from Ron Frances. I also bought 3 small LED lights, (two green ones to use as turn signal indicators, and a red one to use as a high beam indicator). The wiring kit enabled me to wire the entire gauge panel and tie it all into one male plug which will then plug into the vehicle wiring harness, The plug allows me to quickly disconnect the gauge panel from the rest of the wiring harness.